Dirty Fingers: No secrets on an agile team. No secrets on a crap game or agile team. I went to San Diego this week to talk about “Healthy Ownership,” with other agile professionals. The experience got me out of the office and listening to others and their challenges making their workplaces better. During the discussion, I recalled an old saying I learned when I worked as a dealer and pit boss at Harrah’s casino, “There are no secrets on a crap game.” It occurs to me that wisdom can be applied to any agile team. Working a crap game in progress, for the uninitiated, is confusing. Dice are flying in the air and depending on the number they land hundreds or thousands of dollars can be won or lost. It is a loud, frantic, and intense game of chance. Since it is so fast, the dealers need to have incredible arithmetic skills, manual dexterity to make payments, the customer service skills of a butler, and the grace under pressure of a bomb disposal expert. It was the most difficult job I ever had. 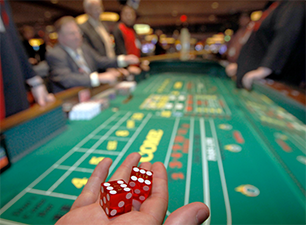 The reason dealers and pit bosses say, “There are no secrets on a crap game,” is things move so quickly on a crap table that bets are often made while the dice are in mid-air. Only by shouting out your bet and having it confirmed by a dealer does it “count.” If the dice bounce off a player’s arm on a crap game the other players will get angry and will often leave the table. The superstitious behavior of gamblers encourages craps dealers to vocalize everything they do. A dealer repeats back bets to the players. A dealer often recites the payouts they are making and where those bets are located on the felt in front of them. All this happens because the game needs to keep moving and no one wants to lose out on a bet. In a world where agile teams have healthy ownership, the teams should exhibit three qualities. For a crap game to be successful, open dialog needs to exist on the crew. It is why everything is vocalized. At casinos, my experience was crews were scheduled together so they learn to work together. Finally, everyone on the crew is accountable if someone cheats or something goes horribly wrong. It seems the casino business was into healthy ownership before agile professionals. What does this mean for software development teams? To achieve open dialog, the development team, scrum master, and product owner need to be in constant communication. Stand up meetings need to be frank and to the point. Product owners should listen in and make sure they can answer questions. Scrum masters should facilitate discussion using the product backlog as the central hub of information. Finally, developers should follow up on acceptance criteria to make sure what they are building is what the product owner needs. If anyone is in doubt the should speak out. To increase empathy on the team, the scrum master and product owner should share a work space. It allows the scrum master and product owner to understand each other’s routine. Using video conference equipment also helps. It lets individuals see each other as real people instead of disembodied voices on a conference call. Teams should work together in open spaces with areas for mob programming and rooms for privacy; I find both are necessary for the success and sanity of developers. The most important piece is to make sure each member of the team understands the challenges and responsibility of the others so they may have empathy. The final outcome of collective ownership is necessary for Healthy Ownership to thrive. It means the scrum master, product owner, and development team share equally the success and failure of each sprint. I find this to be the most difficult outcome to achieve. It requires highly skilled people to give up a little of their ego and make sacrifices for others. To borrow a phrase from Benjamin Franklin, the agile team needs to hang together or all of them will hang separately. To have healthy ownership an agile team needs; open dialog, increased empathy, and collective ownership. The development team should not have any secrets just like a casino craps crew. Following this model will create the healthy ownership which will help every team a success.